Scooby Doo and the Gang....one of our favorite cartoons. This is me and my 4 kids. 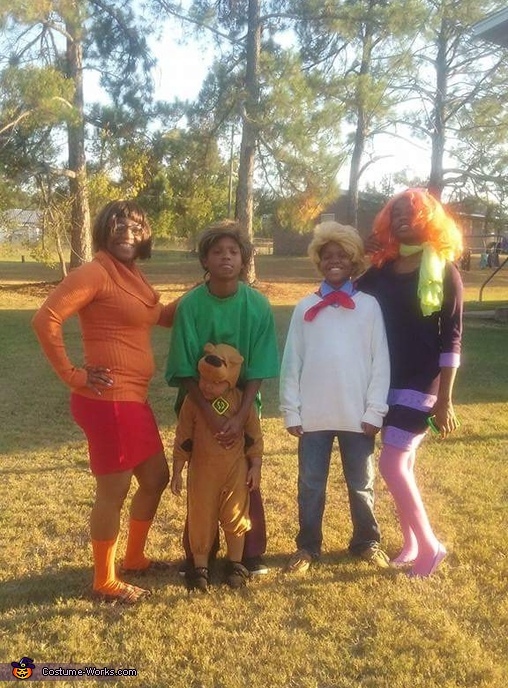 I am Velma, Daryl is Shaggy, Dareik is Fred, Kelece is Daphne, and Elijah is Scooby Doo. I shop at various flea markets, thrift stores, Goodwill and places like that to put their costumes together every year. I spray painted Daphne and Fred's wigs. Shaggy' s goatee is actually a moustache turned upside down. I bought Elijah' s costume from Wal-Mart and put everyone else's together myself. I made the box of Scooby Snacks too.